I don’t make many meals without meat, so Fridays during Lent pose an interesting challenge for me in the kitchen. I don’t often have time to run out for fresh fish on my way home and still have have time to cook it when I get home. I don’t have any interest in eating soy products that have been squeezed into the shape of meat, either. What I’m left with is an opportunity to make vegetables shine in a fresh, flavorful and filling way, and pasta is the perfect vehicle for this. This isn’t a quick meal, but it’s easy enough to make on the weekend when everything is fresh and then store in the fridge all week long. We easily get 3 meals out of this recipe. This dish contains a variety of vegetables that work well together, but also maintain their own unique flavors paired with plenty of cheese to satisfy big appetites and keep little eaters interested. Let’s get started! 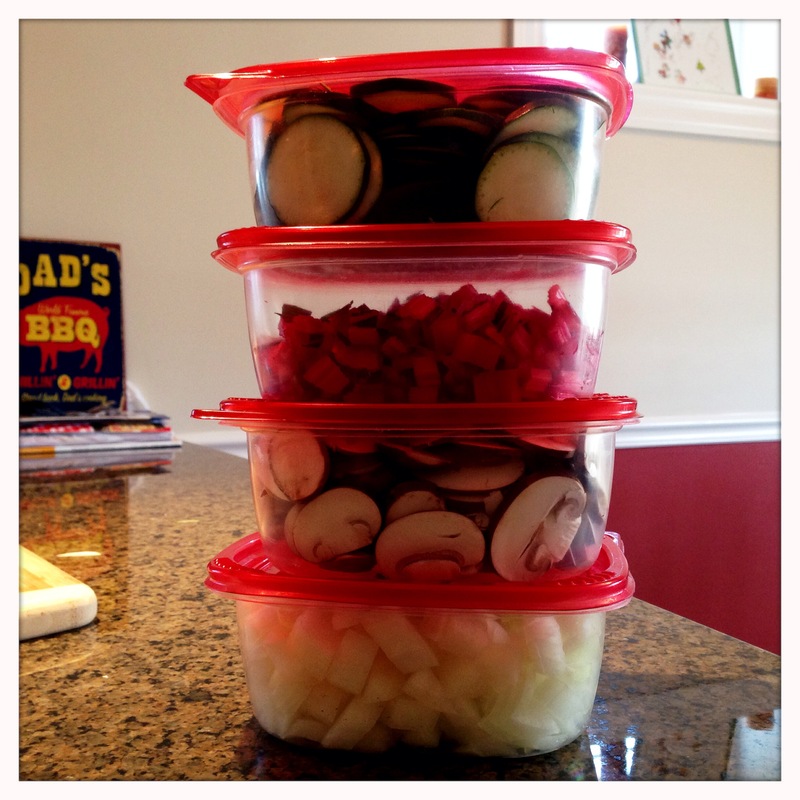 For convenience while cooking, I cut up all the veggies and put them into plastic containers so they could be easily added to the pan when needed. Preheat your oven to 325, and get a pot of salted water boiling to make your pasta. 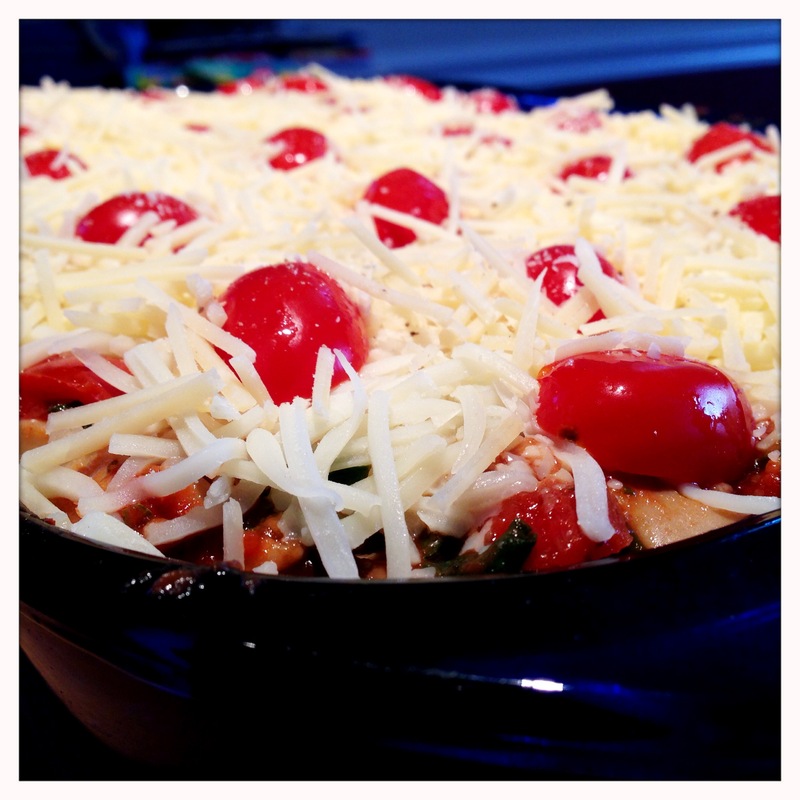 Set out a 9×13 baking dish so that you can assemble the pasta bake as the components are prepared. 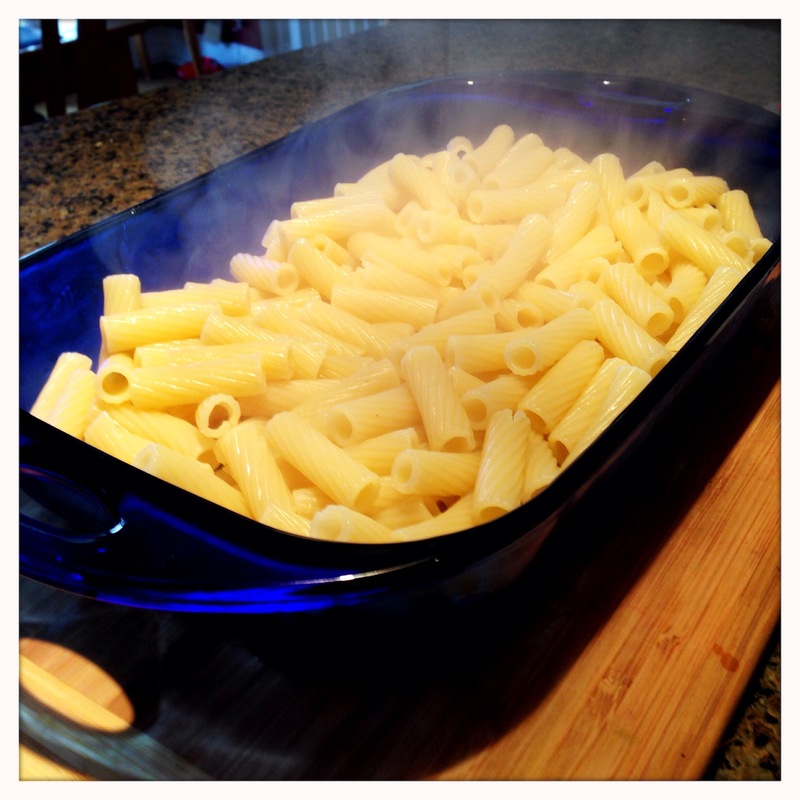 Cook the pasta according to the directions on the package, strain and place into the baking dish. 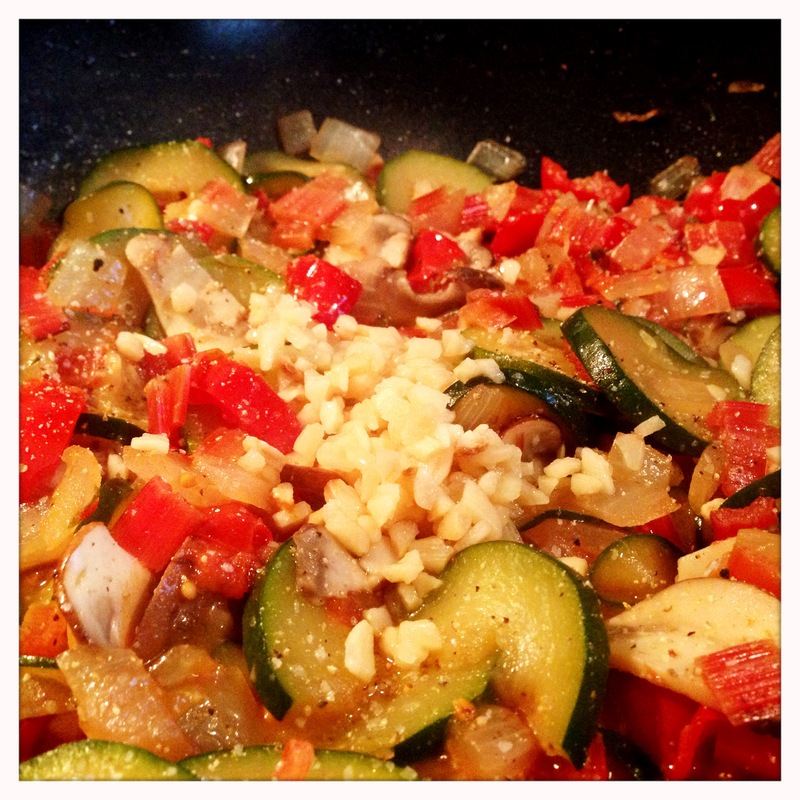 While the oven is heating up and the pasta is cooking, we’ll work on the vegetables and sauce. 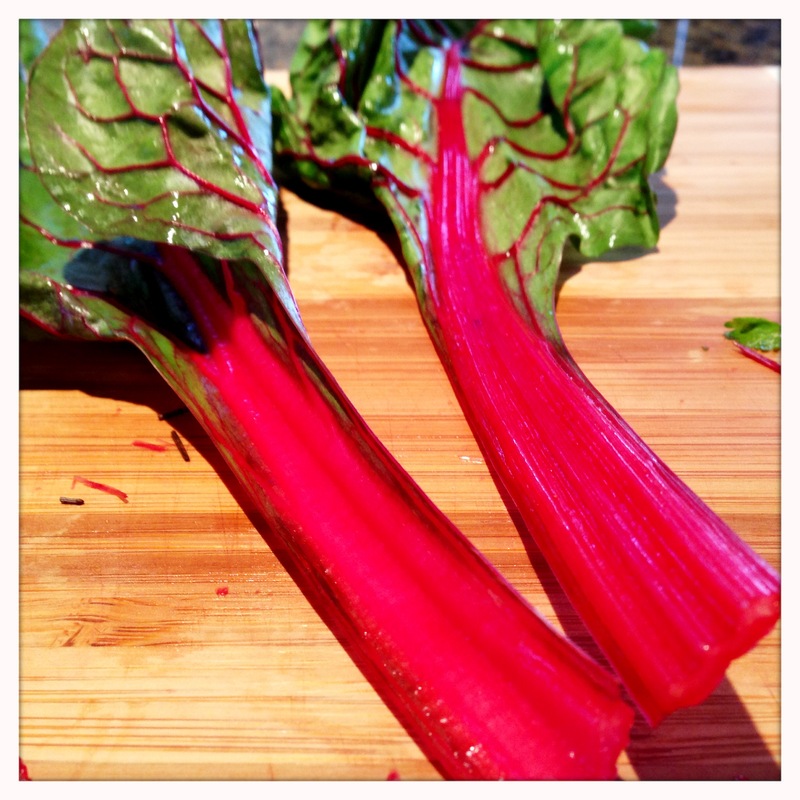 If you’ve never worked with chard, you’re in for a treat. Both the stalks and the leaves are completely edible, and, while they share similar flavors, they both have their own unique qualities. The leaves wilt like any other greens, but the stalks are more fibrous and will hold up to longer cooking times. Separate the green leaves from the stalks. 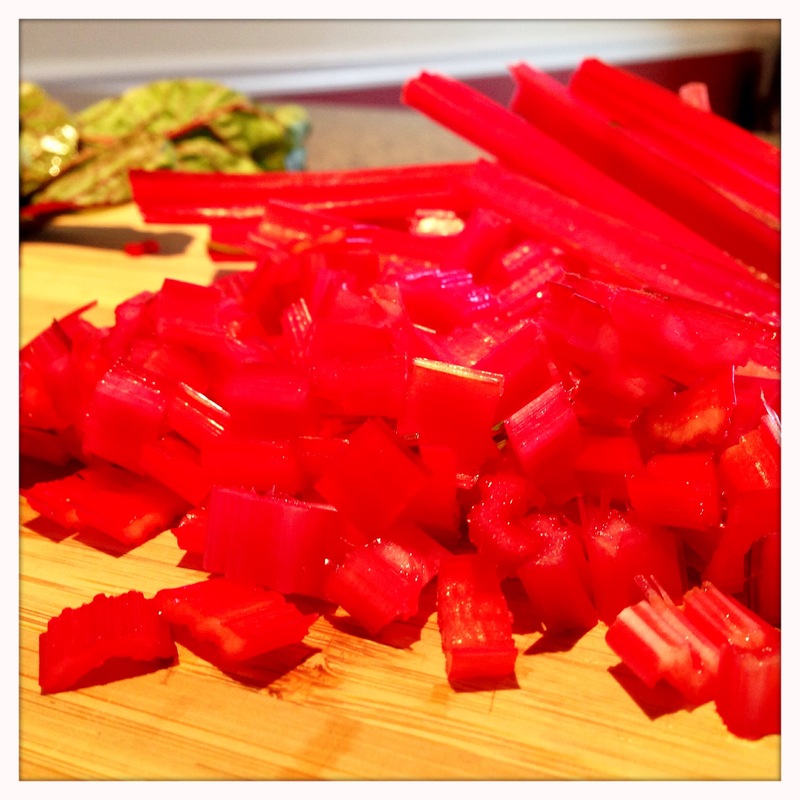 Chop the stalks into 1/4″ – 1/2″ inch pieces, and set aside. Cutting the stalks into small pieces eliminates the stringiness of the bigger pieces, making them deliciously tender when cooked. For the leaves, we’ll be looking for small, bite sized pieces that will be easy to distribute throughout the pasta. 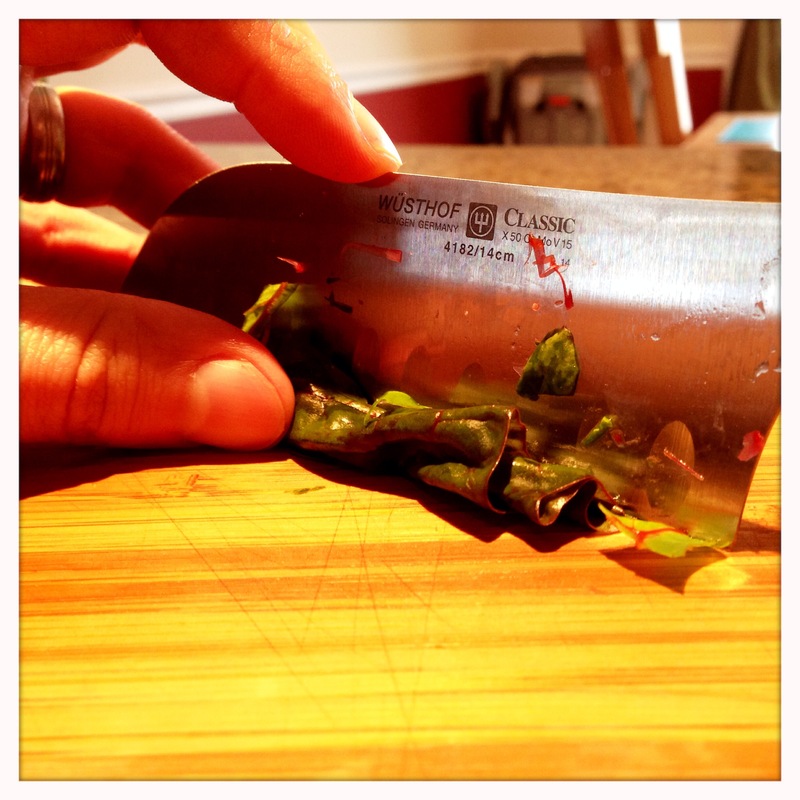 The easiest way to quickly chop up these large leaves is by rolling them. First roll a leaf into a tight roll, and then slice lengthwise through the roll. Now, holding the split roll, chop perpendicular to the roll, creating 1/2″ long pieces. Set the greens aside for now. They will be the last thing we add to the sauce before placing everything into the oven. Chop the onion. 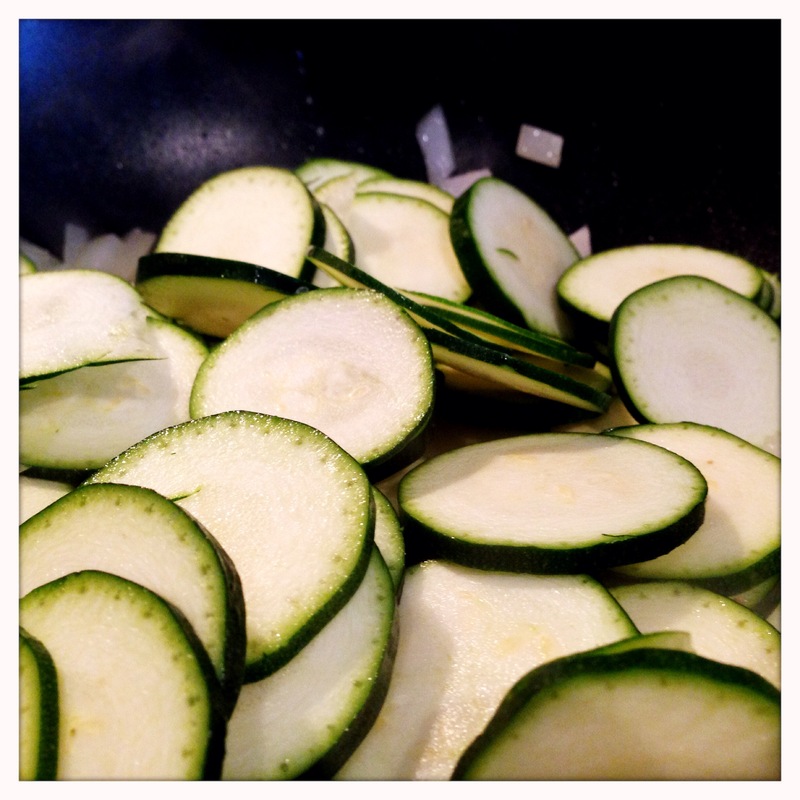 Slice the zucchini into thin rounds, and thinly slice the mushrooms as well. 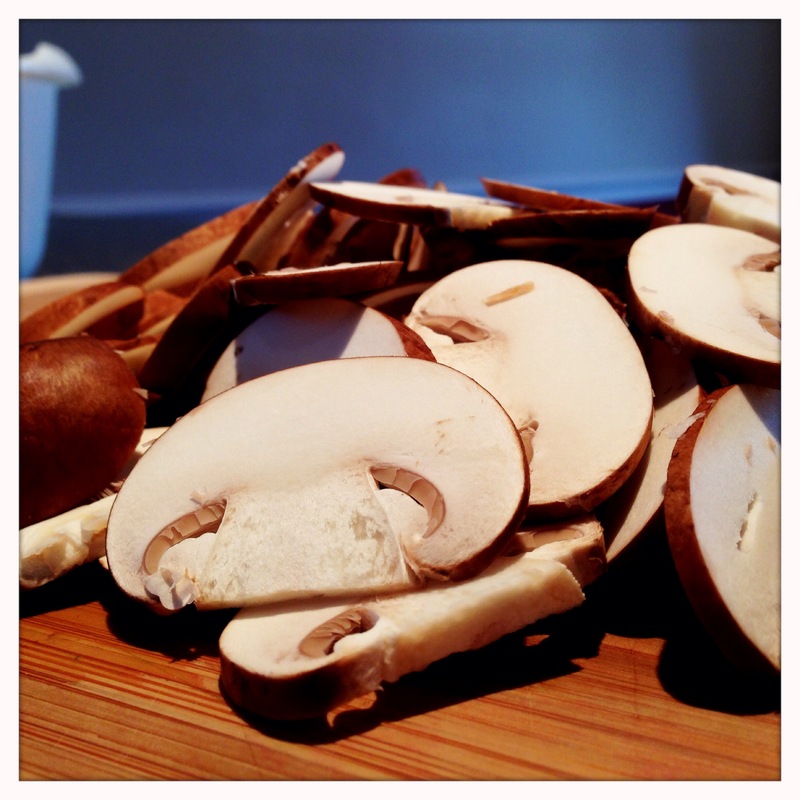 You can use large slices of mushroom to create a heartier texture, if you prefer. I think the thin slices worked very well here, though. You may have noticed there is no pasta sauce listed in the ingredients. 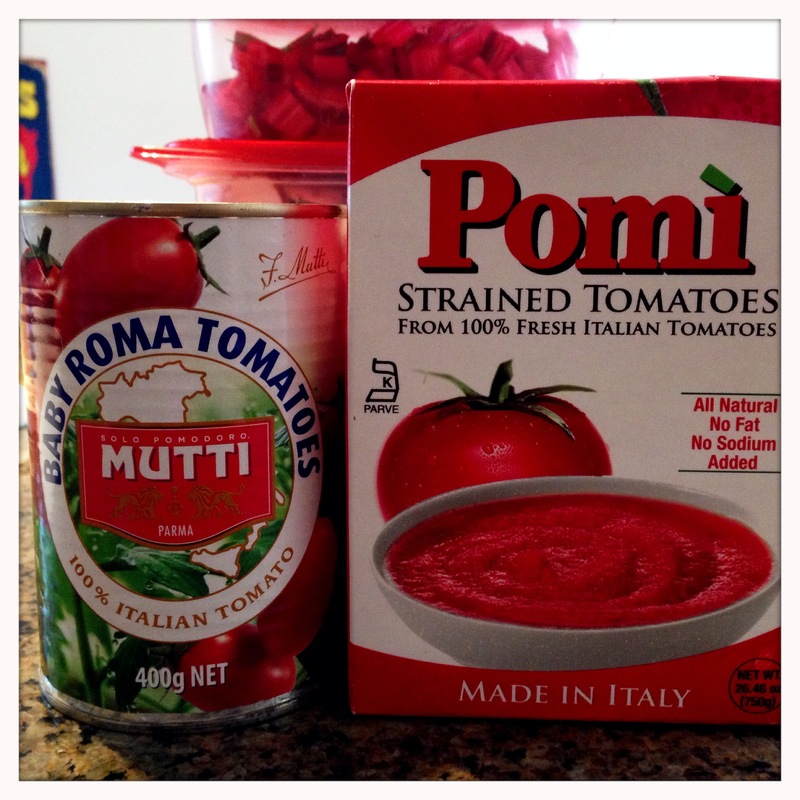 Instead, I went with some canned whole and strained Italian tomatoes. This provided a much fresher, brighter flavor, perfect for spring and an ideal match to the other vegetables in the dish. Reserve about a third of the whole baby romas, and chop the rest. The reserved baby romas will be halved and placed on top of the dish before baking. Now that everything is prepped, it’s time to get cooking. Heat some olive oil in a pan, and saute the onions until they start to soften. 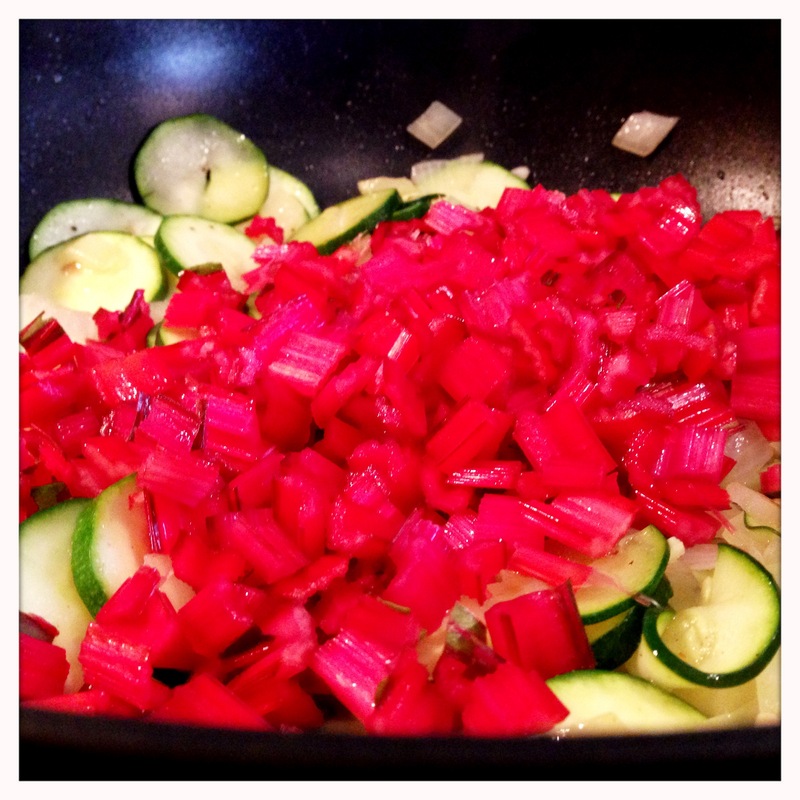 Then add the zucchini. Once the zucchini starts to cook, add the chard stalks. Cook a few minutes more before adding the mushrooms and the tomatoes. Then add the garlic, season with salt and pepper and cook a few minutes until the smell of the cooking garlic starts to fill the kitchen. 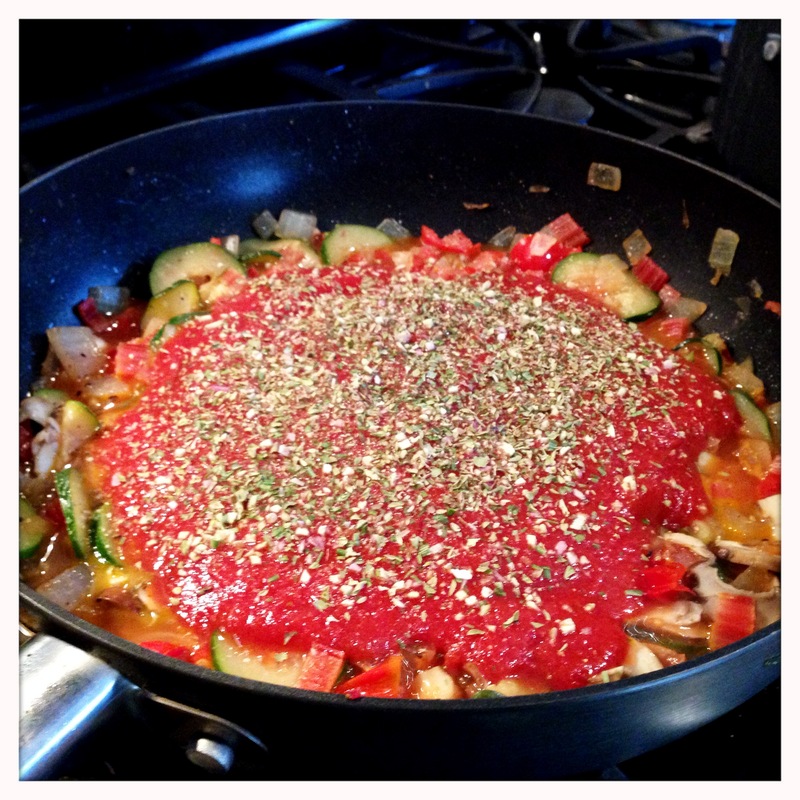 Finally, add the strained tomatoes and a healthy dose of your favorite Italian herbs (fresh or dried). Add a little more pepper and/or salt to taste if needed. 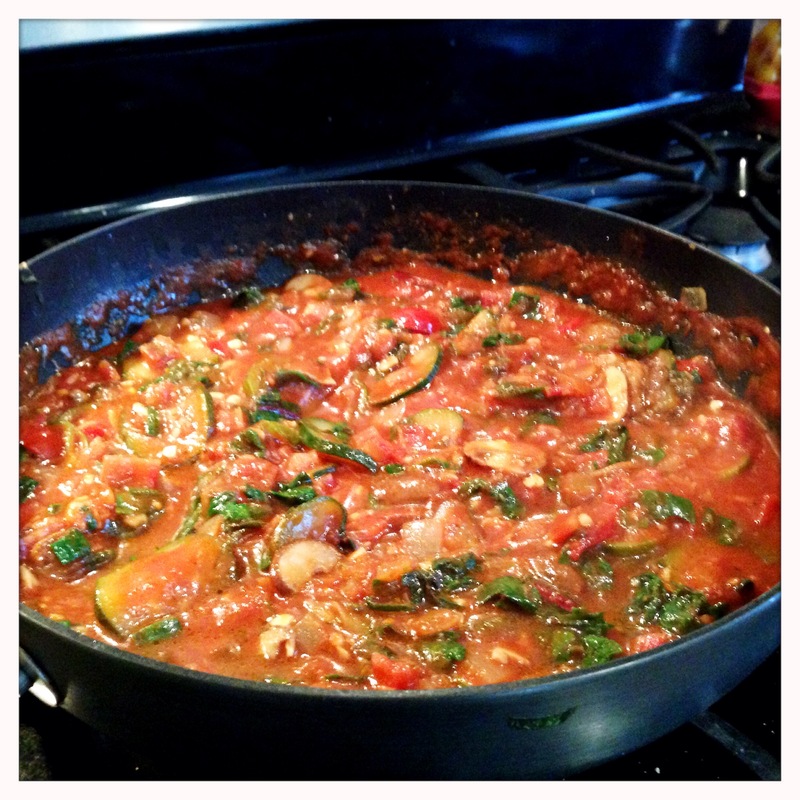 Stir the strained tomatoes into the vegetables and let this simmer for a few minutes. 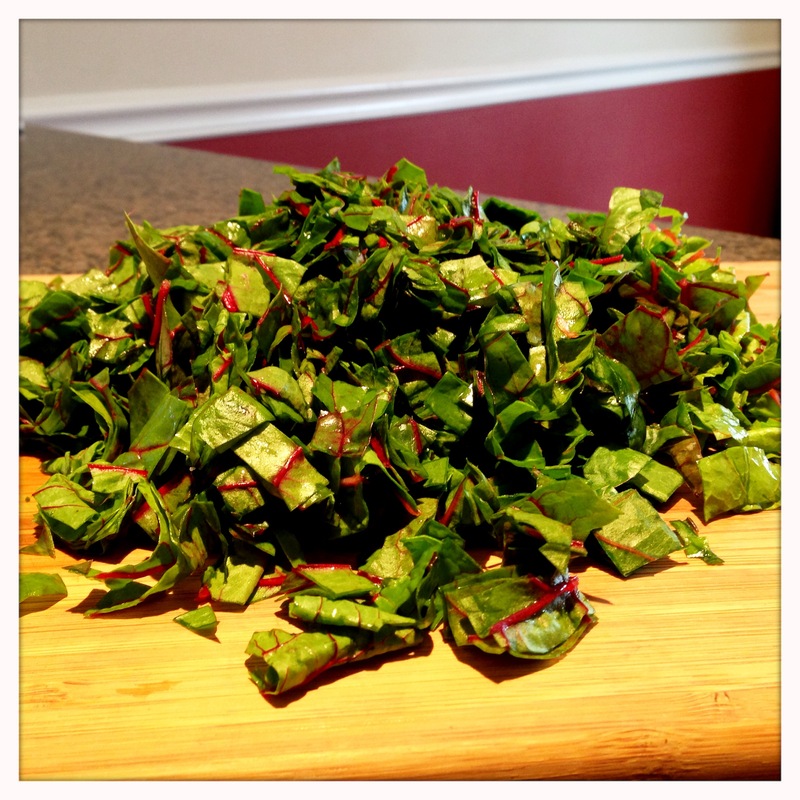 While it’s simmering, it’s time to cook the chard leaves. Heat some more olive oil in a separate pan. 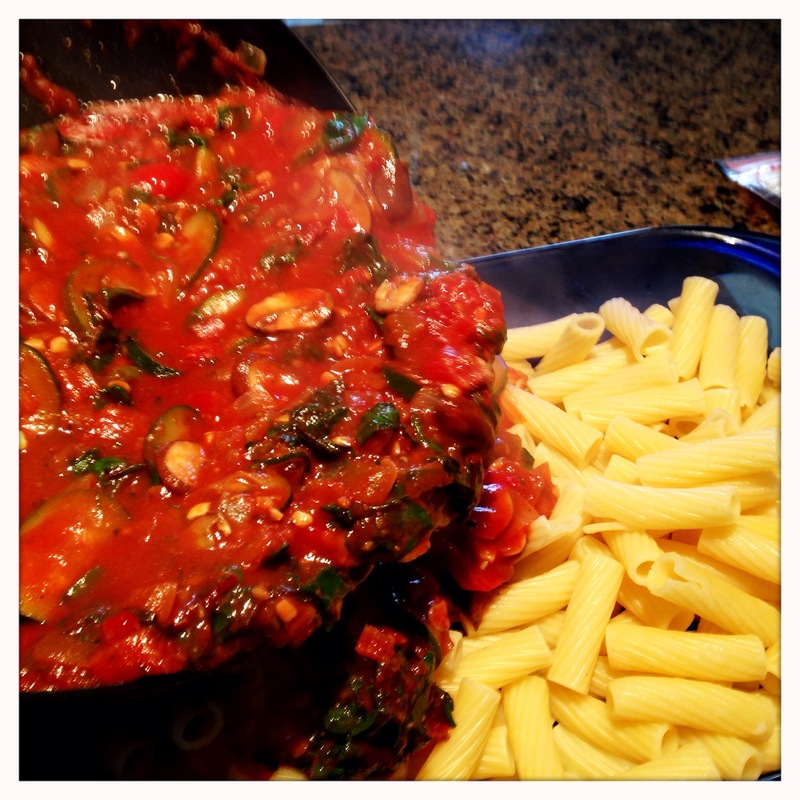 I used the pot from the pasta to avoid adding yet another pan to clean. 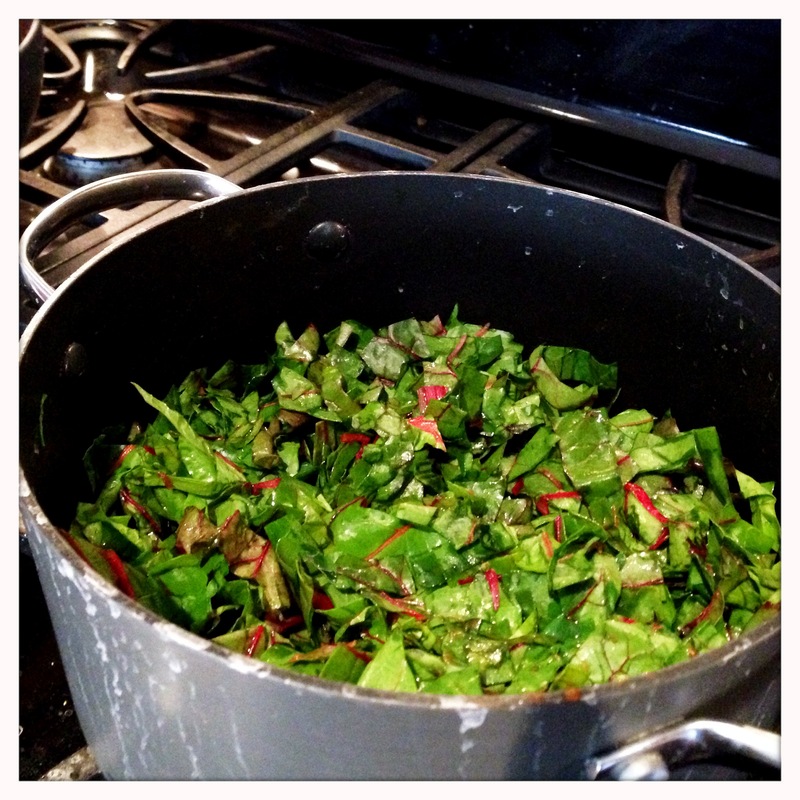 Add the chard to the heated oil, season with salt and pepper and cook for a few minutes, stirring continuously. The leaves will soften and turn a brighter shade of green when they’re ready. Then add the chard to the sauce, and stir to evenly distribute. 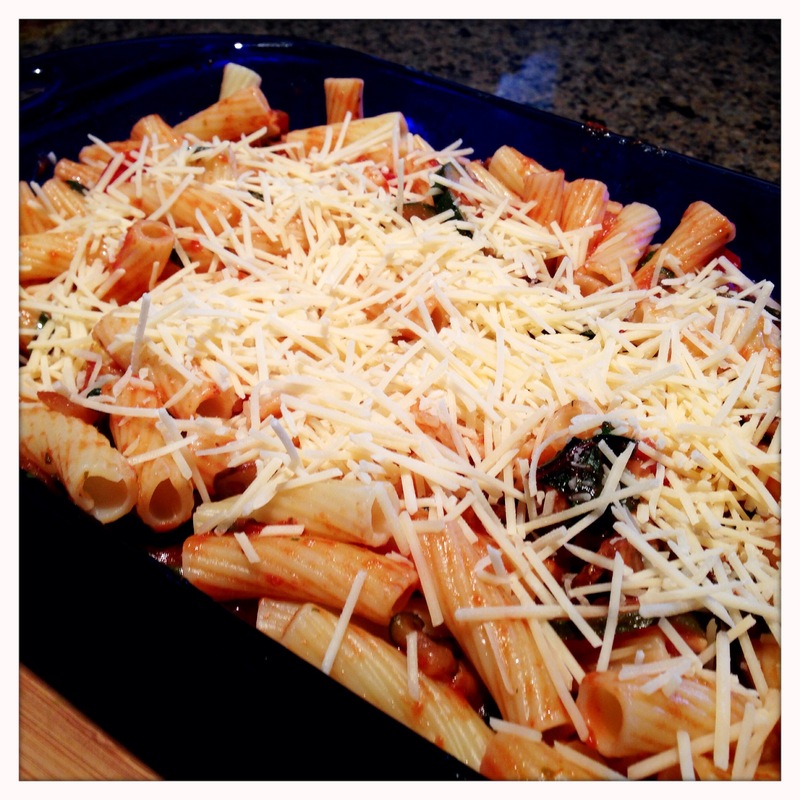 Pour the sauce and vegetables over the pasta into the baking dish. 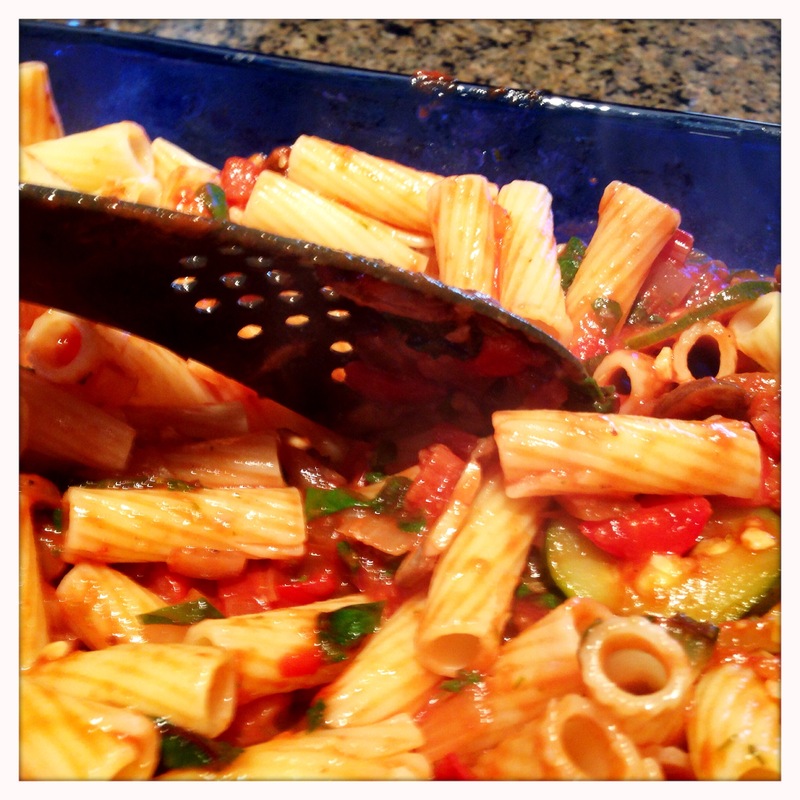 Gently turn the pasta over a few times with a spoon to make sure the sauce and veggies are spread throughout the noodles. Add about half the parmesan cheese to the noodles, and stir again to spread throughout the dish. This will melt during the baking and hold everything together. Finally, cover the pasta with the mozzarella and the remaining parmesan. 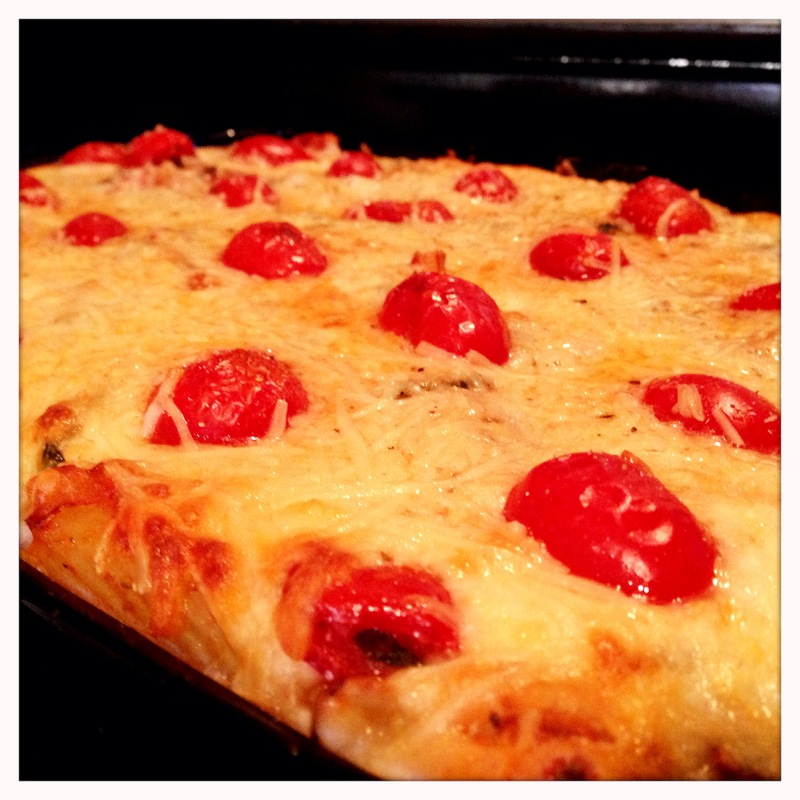 Top with the halved baby romas, and place into the preheated oven. 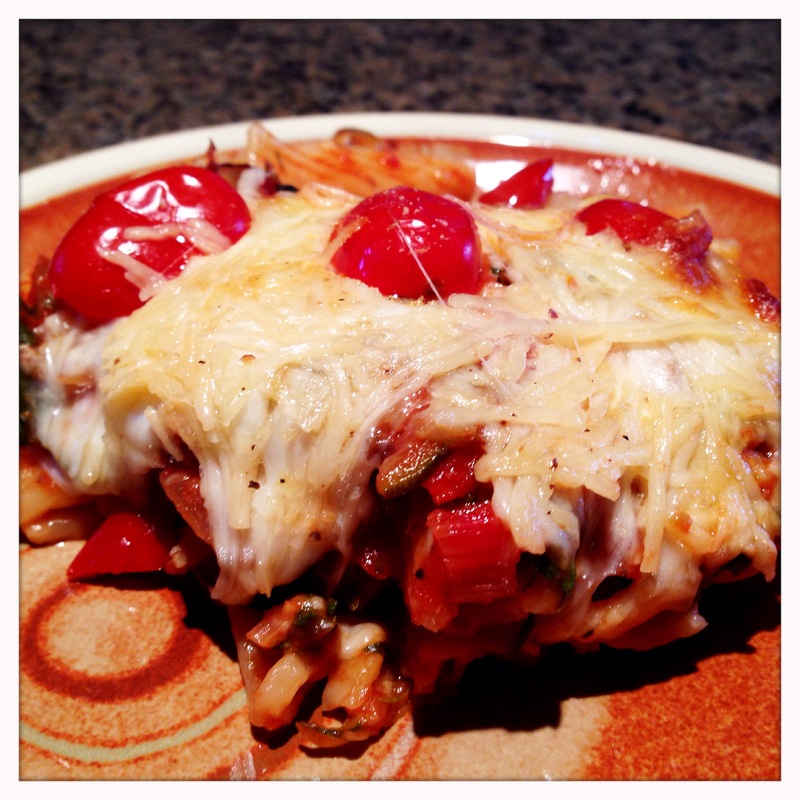 Let the pasta bake for about 30 minutes. Time is not too important here, as everything is already cooked, but you want to allow ample time for the cheese on top to start to caramelize and set. Use a large spatula or spoon to pull servings out of the dish. The cheese inside should help the pasta come out in a more solid piece. Remember, you don’t have to be a vegetarian or a Catholic during Lent to enjoy a meatless meal. This dish more than satisfies my hunger any time I make it, and it’s a great way to introduce little eaters to new vegetables. 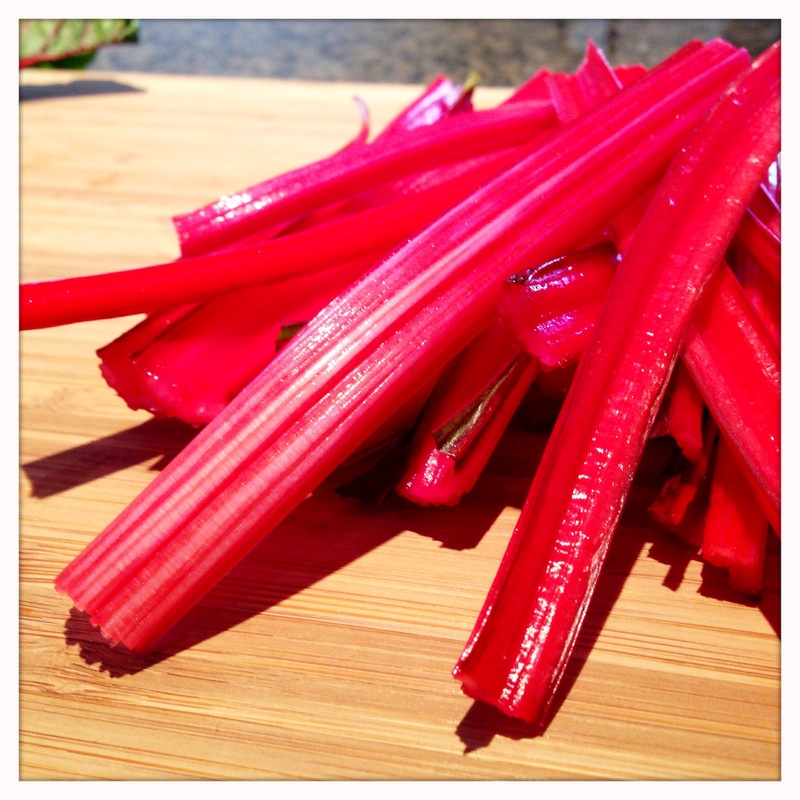 Chard is a challenging flavor for younger palates, but it’s important to introduce new flavors early. Trying new foods may not always result in a new favorite, but there’s no way to know unless we try. Enjoy!